In my pre-keto life I was the Chocolate Pie Queen. Yasssssss honey! I made homemade chocolate pie like it was my job and between you and me, I was dang good at it. Kind of like Minnie in The Help but without the secret ingredient! Every time my mom would come to visit or we were going to visit her, she’d request chocolate pie. This Thanksgiving we had plans to visit our family in Tennessee and mom asked me if I was bring chocolate pie this year. Initially I said no because I don’t keep flour and sugar in the house anymore. But the more I got to thinking about it, I wanted to attempt making a low carb version of my infamous Chocolate pie. 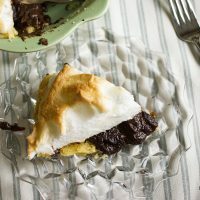 And that, my friends, is the inception of this keto chocolate pie with meringue! First, you must be patient. It takes a little bit of time for the filling to come together on the stove. There’s a lot of slow whisking involved. My advice is to put on your favorite apron, ask Alexa to turn on your favorite songs, and sip something you love while you stand over the stove. Second, the temperature must be just right in your kitchen for the meringue to get stiff and hold its shape. A kitchen that is too hot from hours of prior cooking will make the meringue too thin. 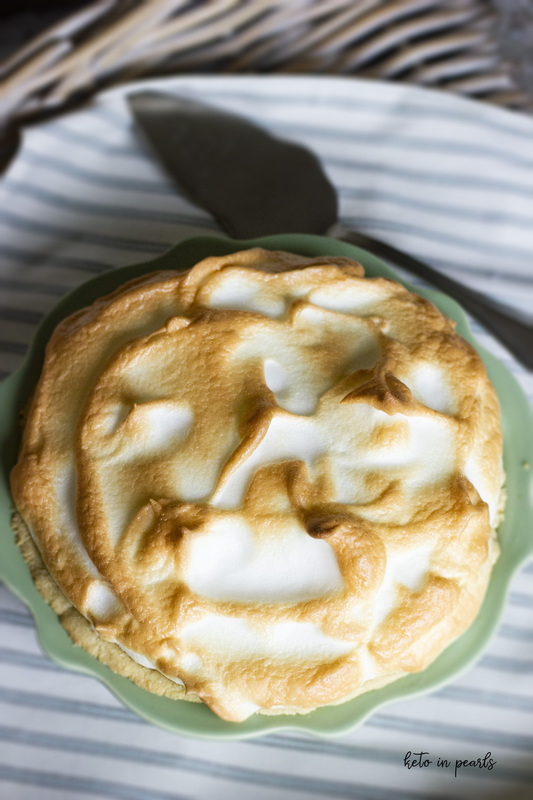 If your kitchen is really humid, that will also effect the consistency of the meringue. I know that can be hard to gauge or change, but it’s just what I’ve learned over the years. Also, room temperature egg whites are a must. Cold egg whites just don’t work as well. Lastly, don’t substitute anything! I am always asked if x can be substitute for y or b for c in my recipes. Sometimes that is possible. However, gluten free baking is a whole different animal and there just aren’t always appropriate substitutes. 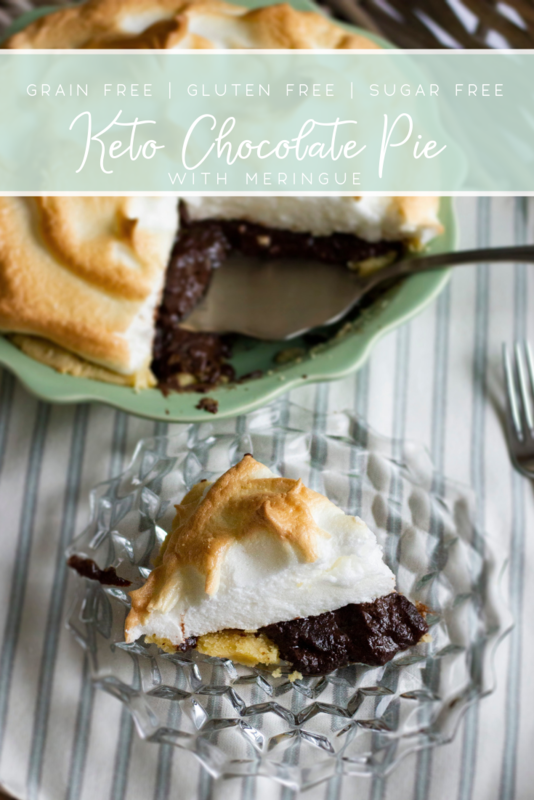 If you follow this recipe as it is written, I promise you will be left with a keto chocolate pie that is silky and decadent. As I mentioned at the beginning of this post, I took this pie with me to my family’s Thanksgiving this year. If you read my post about keto through the holidays, then you know my family is NOT keto/low carb/sugar free. I was SO nervous for them to try this pie because I wanted so badly for them to like it as much as my old one. And you know what? THEY DID! My Gran and my mom and even the men LOVED this chocolate pie. You know a sugar free and low carb baked good is the real McCoy when it’s loved by all! I hope you love this pie as much as we did! I love seeing your recreations on Instagram (@keto_in_pearls)! Tag me in your photos so I can see and give you all the heart eyes! 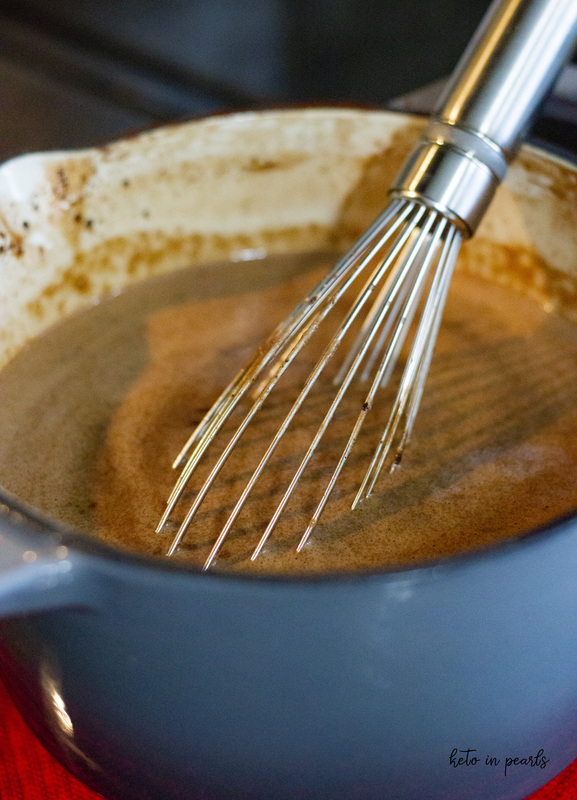 To a sauce pan, add the erythritol, salt, and cocoa powder. Whisk to remove any lumps. Add the half n half and egg yolks and whisk to combine. Turn the heat to MED and add the butter. Whisk constantly until the mixture begins a LOW boil. This will take 15-20 minutes. Do not leave the the filling unattended or it will scorch. When the mixture begins to bubble, add the xanthan gum 1/4 tsp at a time whisking after each time. Let the mixture bubble and thicken as you keep whisking. It should become like a very thick pudding. Do not overcook. Remove the pan from the heat and add the vanilla. Pour the filling into your pie shell. To prepare the meringue, add the egg whites to the bowl of a mixer. With the mixer on high, beat the egg whites with the cream of tartar and vanilla extract until they become slightly firm. With the mixer still on high, add the last 1/4 cup of erythritol, a little a time. The meringue is done when it is firm and you can use the whisk to make peaks. It should hold its shape when done. Pour the meringue on top of the hot pie filling. 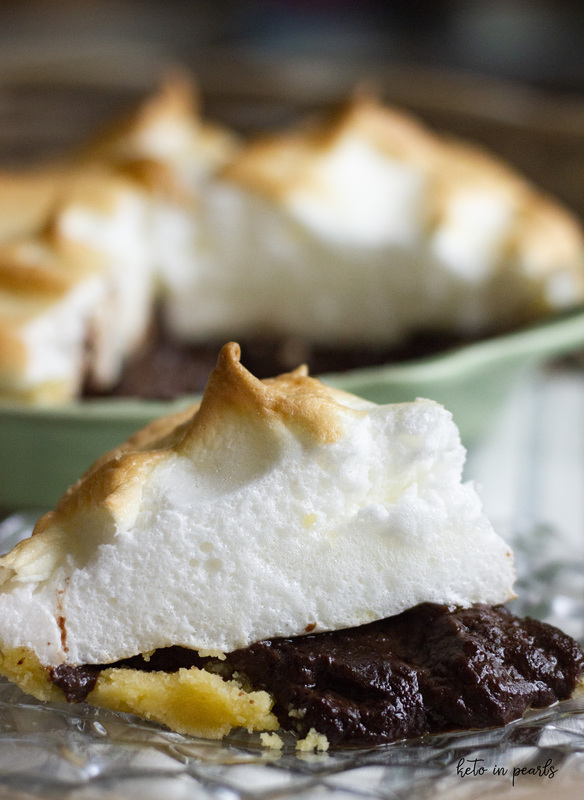 Be sure to seal the edges of the pie with the meringue to prevent shaping. 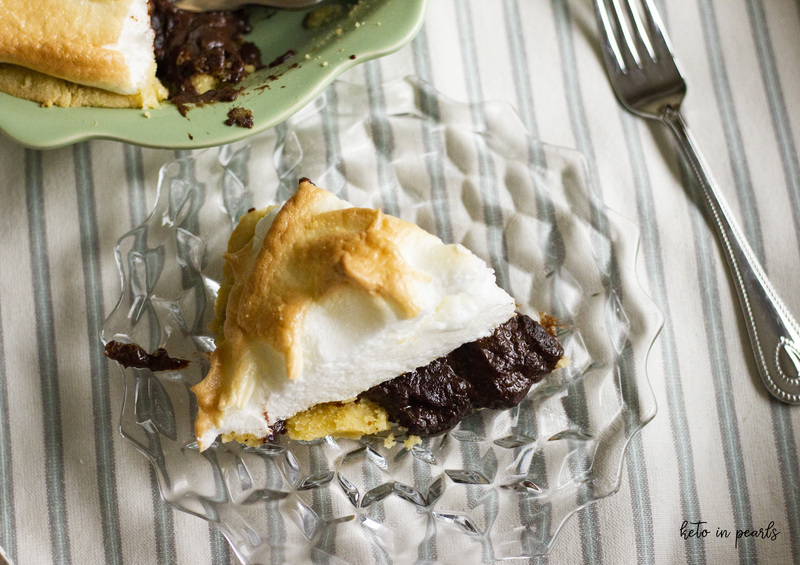 Use a knife or spatula to make peaks in the meringue. Bake the pie 5-10 minutes or until the meringue is golden brown and set. Let the pie cool completely before serving. Store on the counter or refrigerator up to 1 week. Seems like the pie crust isn’t included in the carb count? Am I missing something? No, you’re not. Per the blog post and recipe card, this is just for the filling and meringue. Excellent pie!! Now I need an equally as wonderful coconut cream or meringue pie.